Beloved Simpsons character Apu Nahasapeemapetilon will leave TV screens for continuing episodes of The Simpsons as he is deemed as a racist and stereotypical character. “Thank you, come again.” You may or may not be familiar with these four words. If familiar, you would know that they are the most famous and memorable lines from the character Apu Nahasapeemapetilon when customers leave his store, Kwik-E-Mart, in the beloved show, The Simpsons. Due to the controversy around the character, the producers of The Simpsons have decided to drop the character to avoid all conflict. This means not including him in the story and making no further appearances in the show. There was possible to talk that one of the producers Adi Shankar had found a perfect script to solve the Apu problem. However, this seems highly unlikely and is probably just a script to write him out of the show for good. The reason this controversy has risen was simply around the fact that Hank Azaria, a white man, voices the stereotypical first-generation Indian immigrant named Apu. Hank, although voicing many of the characters in the Simpsons, has been ridiculed for his voicing of Mr. Nahasapeemapetilon. The documentary, “The Problem with Apu”, by Indian American comedian Hari Kondabolu deep dived into why Apu Nahasapeemapetilon is not okay to be on television. The documentary interviewed many other Indian American comedians and actors and how their lives were affected by Apu. First off, it explained how the only reason why Apu appeals to the audience is because of his thick, stereotypical accent. There is really no depth to Apu other than his ridiculous accent. In fact, the documentary proceeded to explain how Apu was not supposed to have an accent at first due to being too cliché. However, at a table read one of the writers used a heavy Indian accent to be funny and it stuck. At Mission Viejo High School, Kamille Kibria, an American Indian student commented on this issue. “I have never been called Apu by anyone,” Kibria said. Maybe it is fair to say that The Simpsons is a show more targeted to earlier generations, rather than Kibria’s generation. She also later stated that maybe the Simpsons could find a real Indian to do the voice of Apu, rather than being voiced by a white man. Another important part of the equation is how Indian Americans have been mocked in reference to Apu as a sign of mockery. Obviously, this has been offensive to many of this minority group. 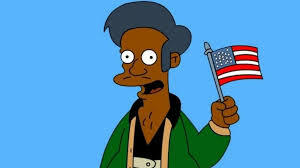 The reason why people would reference Indian Americans as similar to Apu is because in 1989 when the Simpsons first premiered, there was no other representation for Indian Americans. In comparison to 2018 with shows like The Mindy Project and comedians like Hasan Minhaj, there was only Apu who represented the Indian American population on a wide scale format such as television. Hari Kondabolu also compared Apu to a form of Minstrelsy. Minstrelsy is a wavered form of entertainment that makes fun of Blacks as being stupid or foolish, not to mention these “actors” portraying black people were white people with black paint on their face. Apu doing foolish songs and dances, looking silly, and being voiced by a white man fit under the category of Minstrelsy pretty well. What you may be thinking is that Hari Kondabolu is just another annoying civil rights activist who doesn’t look from different point of views other than his own. However, due to the work in the documentary, one can see how he isn’t quite that. He interviewed his first-generation immigrant parents on the subject of Apu. They said they were not offended by the character and that the huge difference between them and Hari was the fact that they are immigrants and he was born in America. We can most likely assume for many “Day-one” Simpsons fans, seeing Apu leave for good will be sad for them. Whichever side you may be on, it is truly a beautiful thing to be able to create a documentary expressing your beliefs about a subject matter. It is equally as grand to disagree with what they are saying. Not too long ago, citizens of this country could not express their freedoms. As previously stated, standing up for your beliefs is a clear sign of an American no matter what race you may be. aYYYY Whaaaat. ur article AMAZING BOIII.